This single-phase three-pole 4-prong 120/240V 20A locking socket is found in some low-power (typically under 4,000W) portable generators. Its pinout is similar to that of L14-30 except the notch in the ground hole is reversed. 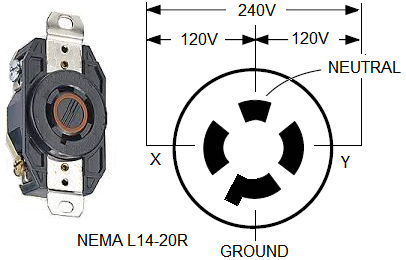 If you follow UL and NEC® 2014 80% loading guidelines, you can draw from this outlet up to 240x20x0.8= 3,840 VA. The mating plug L14-30P is normally wired with #12 AWG. As usual, red and black leads go to X and Y, white to the neutral, and green to ground (refer to this diagram for the configurations of the terminals).